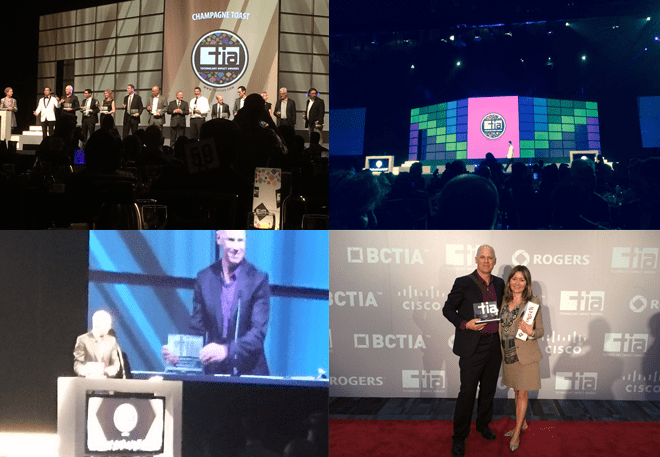 It’s one thing to be among the finalists at the exciting 2016 Technology Impact Awards TIA Gala held by the BC Tech Association in the Vancouver Convention Center, socializing with the beautiful and dressed up local tech crowd, it’s another thing to win. When Freightera was announced as the winner of the TIA for Excellence in Product Innovation, it took us a while to realize this was happening to us :). Eric Beckwitt, Freightera CEO, recipient of the TIA award thanked the BC tech community, BC Tech Association, its CEO Bill Tam and the Freightera team in his acceptance speech and addressed the importance of creating businesses that solve social and environmental problems beyond the bottom line. Freightera is one of many members of the BC Tech Association, who’s core values we share: Be of Service, Succeed Together, and Pay it Forward. We are honored and thrilled to join the TIA Winner’s Circle. Other winners of the 2016 Technology Impact Awards (TIAs) include: Company of the Year – Global Relay; Bill Thompson Lifetime Achievement Award – Keith Spencer, Partner, Fasken Martineau; Emerging Company of the Year – Copperleaf Technologies Inc.; Most Promising Startup – Aspect Biosystems; Adoption of Technology – ResponseTek and Westminster Savings Credit Union; Most Promising Pre-Commercial Technology – Ronin8 Technologies; Person of the Year – Shahrzad Rafati, Founder & CEO, BroadBandTV; Team of the Year – Traction on Demand; Community Engagement – Left and People’s Choice – Buyatab Online Inc.